The publication of Three to Get Lei’d crept up on me last night about as fast as the Hula Maidens can get themselves into trouble! Right now we’re scrambling to get the “Buy” link on the website. Suddenly the book appeared on Amazon Kindle and people must be downloading like crazy because it’s on the Cozy and Mystery Series Bestseller lists already. YIKES! So you can go straight to Amazon to order. Nook is taking a little longer but hang in there and you’ll be able to download really soon. 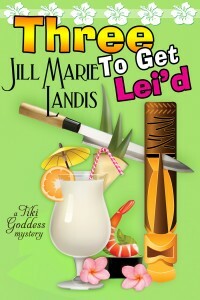 Newsletters will go out some time tomorrow so if you aren’t already signed up, look for the box on the page where you enter your email address and you can stay up to date with the latest Tiki Goddess Mystery and other Jill Marie Landis news. Thanks for sharing the word with your friends, neighbors and anyone who’ll pick up a hula skirt or a cocktail shaker at the drop of a hat. Mahalo for all of your support! 7 Responses to Time to Get Lei’d! Thank you so much Betsy! Pass the word. it won’t be long. Thanks so much for asking. Hope it’s soon! Ready on Nook Now! Mahalo Helen. I have read all three…super fast….anxiously awaiting the next one! Please tell me there will be one, these are such fun reads! I have recommended them to all my friends! Hula Maidens are at it again.